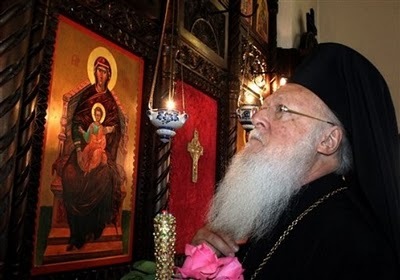 In this interview Bartholomew I, Ecumenical Patriarch of Constantinople, comments on the Latin dogma of the “Immaculate Conception”. The Catholic Church this year celebrates the hundred and fiftieth anniversary of the proclamation of the dogma of the Immaculate Conception. How does the Eastern Christian and Byzantine Tradition celebrate the Conception of Mary and her full and immaculate holiness? The Catholic Church found that it needed to institute a new dogma for Christendom about one thousand and eight hundred years after the appearance of the Christianity, because it had accepted a perception of original sin – a mistaken one for us Orthodox – according to which original sin passes on a moral stain or a legal responsibility to the descendants of Adam, instead of that recognized as correct by the Orthodox faith – according to which the sin transmitted through inheritance the corruption, caused by the separation of mankind from the uncreated grace of God, which makes him live spiritually and in the flesh. Mankind shaped in the image of God, with the possibility and destiny of being like to God, by freely choosing love towards Him and obedience to His commandments, can even after the fall of Adam and Eve become friend of God according to intention; then God sanctifies them, as He sanctified many of the progenitors before Christ, even if the accomplishment of their ransom from corruption, that is their salvation, was achieved after the incarnation of Christ and through Him. In consequence, according to the Orthodox faith, Mary the All-Holy Mother of God was not conceived exempt from the corruption of original sin, but loved God above all things and obeyed his commandments, and thus was sanctified by God through Jesus Christ who incarnated Himself of her. She obeyed Him like one of the faithful, and addressed herself to Him with a Mother’s trust. Her holiness and purity were not blemished by the corruption, handed on to her by original sin as to every man, precisely because she was reborn in Christ like all the saints, sanctified above every saint. Her reinstatement in the condition prior to the Fall did not necessarily take place at the moment of her conception. We believe that it happened afterwards, as consequence of the progress in her of the action of the uncreated divine grace through the visit of the Holy Spirit, which brought about the conception of the Lord within her, purifying her from every stain. As already said, original sin weighs on the descendants of Adam and of Eve as corruption, and not as legal responsibility or moral stain. The sin brought hereditary corruption and not a hereditary legal responsibility or a hereditary moral stain. In consequence the Panagia participated in the hereditary corruption, like all mankind, but with her love for God and her purity – understood as an imperturbable and unhesitating dedication of her love to God alone – she succeeded, through the grace of God, in sanctifying herself in Christ and making herself worthy of becoming the house of God, as God wants all us human beings to become. Therefore we in the Orthodox Church honor the All-Holy Mother of God above all the saints, albeit we don’t accept the new dogma of her Immaculate Conception. The non-acceptance of this dogma in no way diminishes our love and veneration of the All-Holy Mother of God. Can you elaborate on this theme a bit more? Is the Orthodox view in this regard as per Patriarch Bartholomew's comment similar to the Wesleyan view of Prevenient Grace? If the mother of God did not have original sin from conception and original sin brings mortality. Why did she repose? The roman church writes about her dormition in the catholic catachism, and the eastern rite catholic celebrate her dormition litugicaly. If she was born with out sin why did she die? The doctrine of the Immaculate Conception of Panagia-Mother of God instead of making her more pure,as the Roman Catholic Church wants to achieve,in fact cancells all her virtues,because it does not let Her complete willing Obedience to God shine…if she was already,by a special gift of God without the original sin,then it was not her own virtue the submission to God's Will…she had not to fight with temptation and become victorious against it..On the contary Orthodox Church names Her superior to Serapheims and more glorious than the Heroubeims because she was the first human being that willingly obeyed God's Will to utmost detail….and thus she became Mother of God…This is the unique virtue of Panagia…and she was cleared of the original sin at the moment of her Annunciation by accepting Her Creator in Her Womb….! From what I understand (which I admit isn't much) of the Wesleyan view, yes, I think so. The two are not exactly the same, but very similar. My understanding of the Wesleyan view is that it relies upon St. Augustine's views of grace, which, of course, aren't shared by the Orthodox. If you replace “prevenient grace” with “image of God” then they are very much in agreement. Either way, the end result is essentially the same.